I usually write to convey the activities in my life. This weekend I documented a fair bit using my camera. I got some great shots and I have been practicing my video editing skills so I thought I would try it here. I hope this works. Check out the Whalen's Wanderings weekend below. This is a great start to the summer I think. 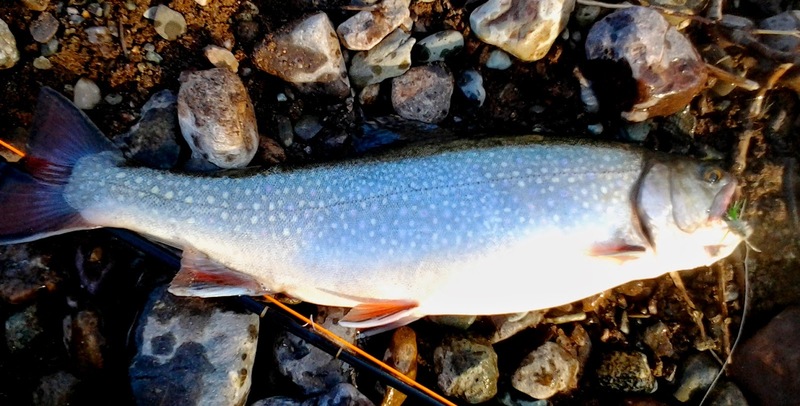 On a fly tied by Art Marr in Sussex Corner I caught this beautiful 16" brook trout. Speckled trout are an incredibly beautiful sport fish. They have colorful spots, sleek lines, and a cool sport stripe on their pectoral fins. When you pursue the speckled trout you chase poetry in motion. The right light, the right water level, the right fly, and the right presentation at exactly the right place. The poetry when understood is relaxing and soothing, even when you can't finish the poem. Tonight I was lucky. I got to finish the poem. I have to be honest, I haven't read much poetry from the book of spring fly fishing but I thought I'd try it any way. The warm evening had no flies, although I did have a couple land on my bare arm. I had no ideas really what type of fly to fish. I had asked around and some anglers with more experience than I had told me that muddlers and nymphs usually work for early season trout. I had some nymphs and a couple of different color muddlers in my arsenal and so I decided to try Trout Creek. I usually prefer fishing in back country areas but on this night I fished in the urban core. My time was limited so I didn't want to drive that far to get to a hole. I wasn't expecting to catch much anyways so I didn't think it would matter. I first tied on a black and yellow nymph and cast it a few dozen times before I lost it when I struck it off a high gravel bar and I'm assuming broke the knot at that time. Next I tied on a mottled colored nymph. I cast it for likely 20 minutes or so. My confidence in my ability was waning with every cast. Am I presenting it right? Is this a good color for these conditions? Are there any fish there to start with? This is where fishing becomes more challenging. You have to trust your skills and instincts. The urban setting lead people to the shore who wanted to check on how I was making out and I humbly relayed to them my lack of experience. A couple of fellas even stopped nearby to clean off their fiddleheads. I was thinking maybe I should have went picking with them instead of throwing a fly all night. The social setting made the night a bit more enjoyable though and I enjoyed the intermittent talks with friends and strangers. It kept me at it, as I didn't want to be seen as a quitter or simply a fair weather angler. Once again I changed flies going to a dark muddler and after about 30 casts on it with no action I thought it might be a bit to dark for the water and light conditions. I shifted over to a green and brown muddler and then the action started. It hardly hit the water the first time and a small trout rose to it but I was a bit quick and missed him. I moved down stream to where a deep run entered into a pool. I cast and floated all over the run before moving to the top of it. From the top of the run I was casting across the stream and letting the fly move downstream to the back of the pool where it floated across the stream. I then stripped it back up stream slowly. I did this three times and on the fourth I hooked a nice trout, approximately 11" in length. I moved out of the area for a bit casting across another pool where I had no luck. I then moved back to the run and fished the pool again. This time I hooked another fish and at first I thought he ran my line around a branch because it felt heavy and he didn't move from the bottom on my first light tug. He then ran downstream a ways and then I realized, he wasn't caught up, he was a big fish. I settled myself in waist deep water and picked my exit point where I could land my catch. I kept the line taut and lightly wrestled my adversary to submission. I had let my earlier trout go and decided that this big catch would be a great meal. A part of me also wanted to keep it so I had proof that I had caught such a nice fish. When I measured it, it stretched the tape 16" and was likely greater than 2lbs. I was giddy when I landed her and couldn't believe how my night had gone from just okay to incredibly great. That is part of the poetry in angling, the way in which your mood changes, or your perception of things is altered with every line. It is so rewarding just being there but more so when the line stretches tight. Tight lines to all you anglers out there...here is to a great 2014 season. The water is crystal clear as the front of the canoe moves out into the main channel. You and your paddling partner are grinning from ear to ear as the current takes its first tug on your floating haven. The sun is shining bright and warm on the back of your right shoulder as you dip your paddle for that first hard stroke. Almost instantly the canoe picks up a significant amount of speed and it creates a breeze on your face and causes your hair to blow behind you. The best part about that breeze is that it keeps the flies away. The river winds lazily between ribbons of silver maples which keep you shaded when the noon time sun and the rowing heat your body beyond your comfort level. Some of the maples bare scars, high up their trunks from where ice scoured against them during the spring freshet. If you were to stand in your canoe, the scars would still be well out of reach and you struggle to comprehend the amount of water that must of flowed through the area during the regular flooding. Your stomach growls and you are brought briefly back to reality when you remember your lunch cooler sitting in the middle of the canoe. You scan down river and spot a gravel bar on the inside of a turn less than a hundred meters away. From the stern position you point the bow toward the gravel bar and instantly your buddy grins approval, without even saying a word, he knows where you're heading. The gravel bar is warm and relaxing as you lazily chew on your sandwich. The flies however, have made an appearance, and you become slightly irritated. You quickly guzzle the soda you had lugged with you and hastily shove the last piece of granola bar into your mouth. As you leave you drop the soda can into a bush and the granola wrapper blows into the current but since you're irritated you decide to leave them. You continue down the river and you start to notice a great deal of litter along the shoreline. Now you feel a bit guilty about your contribution to the problem. Plastic grocery bags hang in the shrubs along the shore like prayer flags, while pop bottles sit like old small ship wrecks on the bottom of the river. You notice oil jugs sitting amongst some chokecherry bushes and feel ashamed. Thankfully, a big, bright tailed, bald eagle flies over head and you once again start to note the amazing gifts mother nature offers. 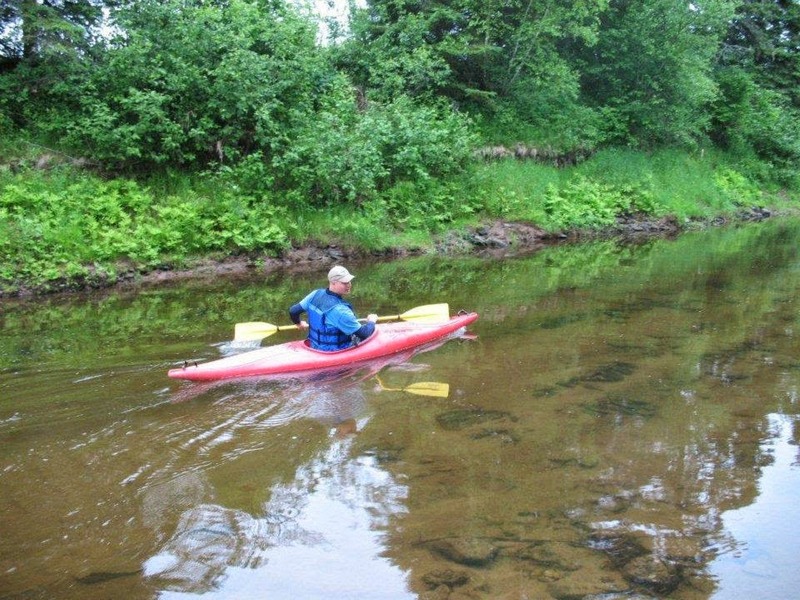 There are many lakes and rivers in New Brunswick and many people take the time to enjoy them. Unfortunately many people also take time to litter and blemish Mother Nature's beauty. If you are out enjoying the rivers this summer be sure to take out the trash you might bring in. Those little cuts add up and it can have an impact on how others perceive our great province and its waterways. If you have time maybe you can even pick up some of the litter you see. Most rivers flow to the ocean not to the water treatment plant, and the ocean is not a toilet that easily flushes.